The fish cakes are oven baked with no additional butter other than a generous greasing of the oven tray. They freeze well before cooking and can be eaten for breakfast, lunch or supper! You can fry the fish cakes in a little oil and butter if preferred. Cut the potatoes into even sizes and boil in salted water on the Boiling Plate for 5 minutes. Drain, cover and transfer to the Simmering Oven u ntil tender, about 40 minutes. Drain any excess water created, and mash with the buttery juices from the fish when it is cooked. Season the fish with salt and pepper. Cut the fillets in half if they are large. Wrap the fish in a foil parcel with a good sog (1 oz) butter. 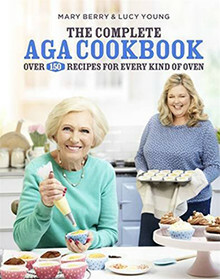 Bake on the grid shelf on the floor of the Roasting Oven for 10–12 minutes or until the fish is opaque and flakes in the centre when tested with a fork. Flake the fish into a bowl with the mashed potatoes, discarding any bones. Add the rest of the ingredients, apart from the breadcrumbs. Taste and season well with salt and pepper. Allow the mixture to cool, then put into the fridge until firm enough to shape. 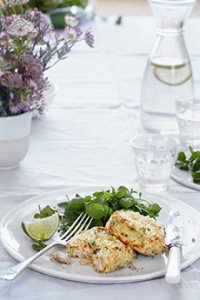 Divide the mixture into twelve even-sized fish cakes and roll in breadcrumbs. Cover and chill if time allows. Preheat a baking sheet covered with a piece of baking parchment on the floor of the Roasting Oven. Generously butter the hot paper using kitchen paper. Bake the fish cakes in the Roasting Oven for 4 minutes, turn over and bake for a further 4 minutes until golden brown and piping hot. (If you don’t preheat the baking sheet the fish cakes are apt to spread.) Alternatively, fry on the Boiling Plate in some butter. Prepare the fish cakes up to 2 days ahead to the end of step 4. They also freeze well for up to 2 months. Bake the parcel of fish in an oven preheated to 200°C / Fan 180°C /Gas 6 for 12-15 minutes until the fish is opaque and flakes easily. Make and shape the fish cakes as above. Preheat a heavy baking sheet in the oven. Lightly grease with butter and put the fish cakes in a single layer, brush with melted butter, then cook at 220°C / Fan 200°C / Gas 7 for 20 minutes until crisp, golden and hot through. Using the ingredients below, follow the recipe above.